On Sunday we drove cross-country to to Sheldon Marsh State Wildlife Preserve just outside Huron, Ohio, a Lake Erie shoreline community. It was a cool, blue-sky day and perfect for a casual nature/photo walk in the protected area. We usually visit this area late in the season — after the large wading birds have left, fleeing the approach of freezing weather. This early-season day, however, saw a large number of wetland- and water-loving avians including no fewer than three great egrets. One of the striking, white giants was hunting the shallows along our path. We stopped to watch and photograph the bird which was surprisingly tolerant of our actions. It hopped into the air once but alighted in the shallows only a few feet away. She Who Must Be Obeyed got one good shot and I, with a faster camera, came away with two. We watched and waited a while longer and, as anticipated, the egret either grew tired of our spying or decided to seek better hunting grounds. Holding down the shutter release I fired off a number of frames and got a couple of nice shots (one seen below) of the action. 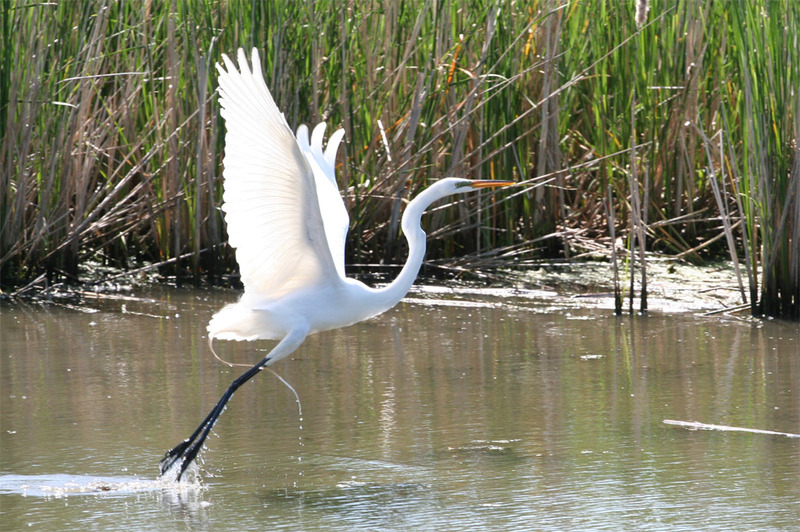 I've mostly stalked the wild great blue herons prior to this and these are my first images of the great egret. I'll be back for more! 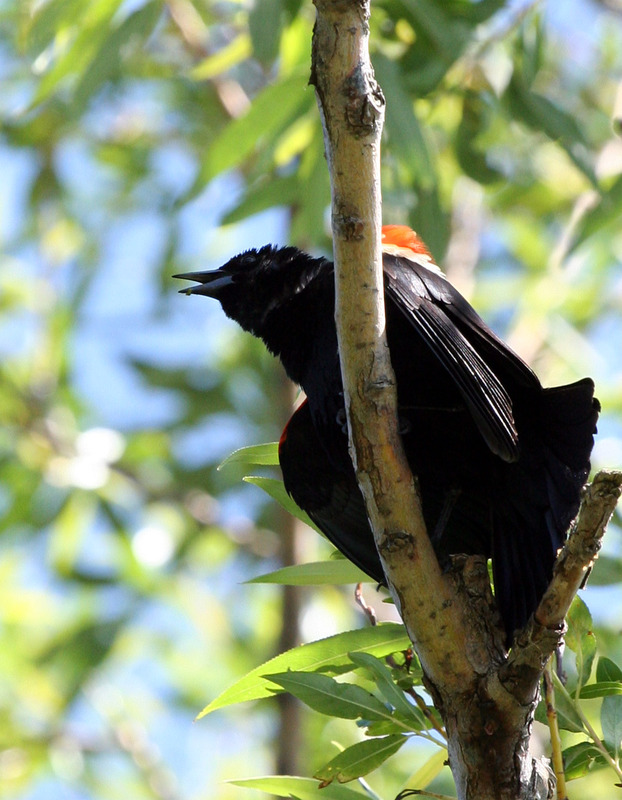 A common call heard across the nature preserve came from the male red-winged black birds as they defend their territories against intruders. They are most famous for their "Okalee" call and we stopped to watch, listen, and photograph one handsome fellow as he puffed up to stake his claim. The red-wings' were the most common bird calls echoing through the wetland woods but there were many others. Among the most beautiful were the songs (again, probably for territorial announcements) of the male cardinal. It was a beautiful and relaxing afternoon which we greatly enjoyed and we left considering how we can balance highly active days (cycling) with quieter activities such as nature walks and hiking. 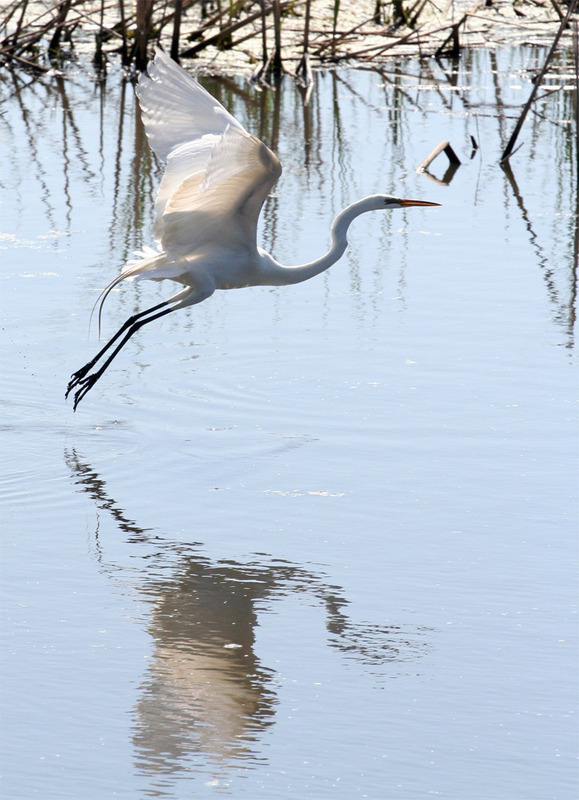 The egret photos are superb, especially the top one with the reflection. The black bird looks a little evil!